Blend the oil, lemon juice, salt, pepper, and tarragon in a blender or food processor. Set aside. Preheat a charcoal fire or gas grill to high. An indoor broiler may also be used. Mix the goat cheese with the garlic and tarragon. Season with salt and pepper to taste. Set aside. Brush the mushrooms with the olive oil. When the fire is hot, grill the mushrooms on both sides, until they begin to brown and the juices just begin to exude. Remove from the heat and set aside in a single layer to cool. When cooled, cut the mushrooms on the bias into thin strips to expose the maximum amount of interior surface. Sprinkle with salt and pepper. Set aside. Remove the seeds and membranes from the roasted peppers. Set aside. Lightly oil the mold or spray it with cooking spray. To build the napoleons, cut the mushroom caps and roasted peppers into thinly sliced pieces to fit the diameter of the mold. Place a layer of the mushrooms in the mold. Top the mushrooms with a layer of the goat cheese mixture, about 2 teaspoons. Gently push down the goat cheese into a layer about the same thickness throughout. Top with a layer of roasted pepper and then another layer of the goat cheese mixture. Continue in this fashion until the mold is full and stands about 1 to 1 1/2 inches high. Each napoleon should have about 4 layers of vegetables and 3 layers of goat cheese. Refrigerate the molds for at least 30 minutes before serving. To serve, push the napoleons out of the molds, if necessary. 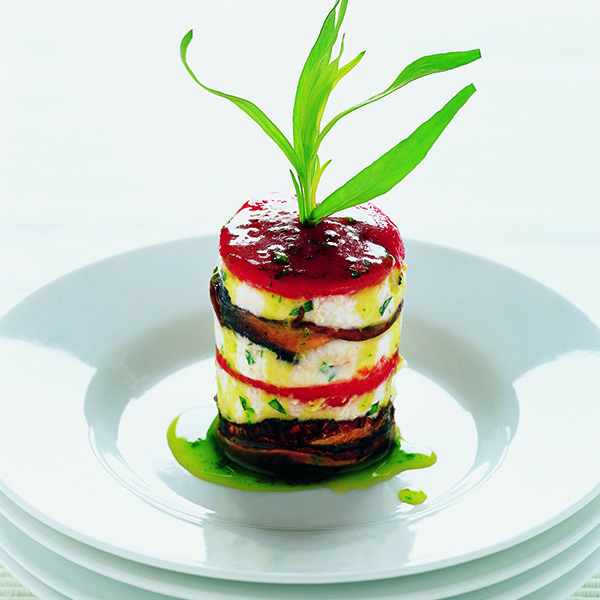 Decorate the tops of each napoleon with the bell pepper strips and fresh tarragon sprigs. Place each napoleon on a serving plate and drizzle about 1 teaspoon of the dressing over the top of each one.